As of December 1, 2018 all employers in Canada must be compliant with the New WHMIS 2015 Regulations. This update to Canada's WHMIS Regulations ensures alignment with the worldwide hazard communication system known as the Globally Harmonized System (GHS) of Classification and Labelling of Chemicals (GHS). 1. All UPEI hazardous products have to be classified to comply with WHMIS 2015 regulations. WHMIS 1988 had six Hazard Classes with three Divisions. Now WHMIS 2015 has 32 Hazard Classes with Multiple Hazard Categories. 2. All UPEI hazardous products must be labeled according to WHMIS 2015. A workplace label must: 1) Identify the product; 2) Provide information on the safe handling of the product; and 3) Indicate that a Safety Data Sheet is available. A workplace label must be affixed to any product that has been decanted into a smaller container for use. Containers of 100 mL or less must have their product identified, but do not have to have precautionary or hazard statements on the label. Containers of 3 mL or less can have a removable label (if such a label will interfere with normal use of the product). 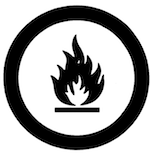 WHMIS 1988 had eight symbols within a black circle (see Image 1). The New WHMIS 2015 has nine pictograms within a red square oriented on one of its points (see Image 2) and one pictogram within a black circle (biohazardous infectious materials). 3. All UPEI hazardous products require new Safety Data Sheets (SDS) to comply with WHMIS 2015. WHMIS 1988 had Material Safety Data Sheets (MSDS) with nine required sections and they had to be updated every three years. The New WHMIS 2015 requires SDSs with 16 required sections and these SDSs have to be updated as required. 4. UPEI Online WHMIS training already complies with the new WHMIS 2015 regulations. All UPEI staff, faculty, graduate students, and student employees are required to complete WHMIS 2015 training. 5. An inventory of all biological, chemical or physical agents used, produced or otherwise present at the workplace that may be hazardous to the occupational health or safety of workers will be maintained. The links to the left provide documentation to assist with getting into compliance by December 1, 2018. It is strongly encouraged that all departments, faculties, labs, researchers and other areas that handle, use, store or dispose of hazardous products on campus start the transition as soon as possible by completing inventories, classifying, labeling, and updating MSDSs to SDSs on all your hazardous products in your respective areas of responsibility. Due to the numbers of chemicals and other hazardous products on campus it will take many months to achieve this goal. Please don't procrastinate because after December 1, 2018 we will be subject to the WHMIS 2015 regulations and if found in non-compliance we will receive orders and/or fines under the OHS Act and Regulations of Prince Edward Island. Please contact a Health, Safety, and Environment team member if you have any questions.